Taghi Amirani’s impressive selection of cellphones. “Today Iran, the UK and the US — tomorrow, The World,” first appeared on Taghi Amirani’s blog on March 10. When I visit my home country Iran, I take an old Nokia 6320i with me. It uses an Iranian SIM with my Iranian number. Reception is great in almost all corners of the country. The phone, which carries my 300 or so contacts out there, is pretty basic, has some useful features including an OK camera. Of course this Nokia listens to me speaking Persian all the time and witnesses all manner of peculiar conversational gymnastics and maneuvers, that make communication between Iranians one of the most complex and multi-layered puzzles in the world. Try to decipher at your peril. You can talk to an Iranian for an hour and not receive or impart any useful information whatsoever. Or you can utter a short sentence and speak volumes with depth, meaning, poetry and emotion all wrapped in subtle and delicate nuance. It’s frustrating but I love it! This Nokia is well versed in “Persian speak” and can soon negotiate its own way around the maze of linguistic challenges. It has had a pretty hard time on my last two visits researching the “Fatherland” documentary. 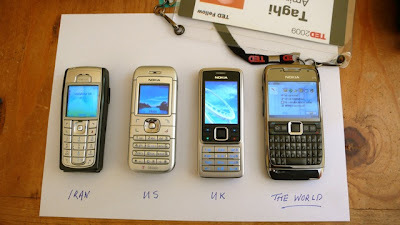 When in the US I use a Nokia 6030 with my American T-Mobile SIM and number. This phone is so basic and innocent I have just recently introduced it to the joys of text. It has all my US-based friends and work colleagues on it and its ring-tone is the jingly ring ring, like the ones your hear in B&W movies with Bogart and Bergman. The conversations this phone listens to are often over-excited and long (me), are about arranging brunches all day, every day, and take place at airports, car rental offices, railway stations, and sometimes are with PBS/Nat Geo people and cool filmmakers. These American conversations are generally “what you hear is what you get” with two exceptions: US Foreign policy* (see below), and talking to Iranians (see above). But most of my US calls normally leave me uplifted and light. It’s that American upbeat, can do, positive thing, or it’s just me projecting. Either way this phone has a pretty easy time most of the time. Now, we can have a whole lot of very profound and complex discussions about cultural identity, how the language we speak shapes our personality, the different masks we wear, or how we think, feel or even experience the world depends on what language we speak. But that’s another blog. My multi-phoned split identity world changed on 2nd February 2009 at the TED Fellows opening reception when the lovely Afdhel Aziz, Nokia’s Senior Marketing Manager, Global Sponsorships and Partnerships, pulled a fantastic magic trick out of a gift bag: Ladies and gentlemen, he gave us the Nokia E71. The surprise sound of the fellows’ jaws dropping on the deck was deafening. Apparently this device can do just about everything short of making the tea in the morning when you wake up. And as if that wasn’t enough Nokia have also unlocked it so it can work anywhere in the world. And THERE is my chance at last. No more 3-phone Tags. Now that I can merge all my contacts from Iran, UK, US and all over, into one single phone with unlimited contact memory; now that I can talk to any of them at anytime from anywhere from one phone, anything could happen. I applied to the TED Fellowship on the premise that if the TED community is to survive and flourish it needs someone like me bridging East and West. Making peace and love between Iran and the US first, and the West in general. Let my new Nokia E71 be the metaphor for that bridge, let it connect people by talking via me. Let it bring peace to all mankind and women who are just as kind. My friend and TED Fellow Rom Feria (Mac Genius) has just emailed to say I need to update the firmware on my new phone. What? Is this thing out of date even before I’ve opened the box?! *In the dark days of Bush foreign policy in relation to Iran, whenever he said “all options are on the table”, that meant we’re willing to bomb the hell out of people, if they don’t do as we say. Now the options on Obama’s table seem to include talking to everyone. Why even just this week he said he would consider talking to the Taliban. Well, bombing the hell out of two ancient civilisations in the Middle East doesn’t seem to have made them love Americans more. So talking may be an option. Afdhel, sponsorship and partnership opportunities here for Nokia?! Taghi Amirani is a lapsed Iranian physicist, devout documentary filmmaker, and TED Fellow 2009. You are currently browsing the archives for the telecommunications category.